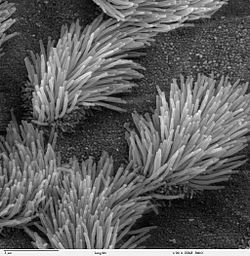 motile cilia, which beat against fluid outside the cell. non-motile, or primary cilia, which typically serve as sensory organelles. In eukaryotes, cilia and flagella together make up a group of organelles known as undulipodia. Eukaryotic cilia are structurally identical to eukaryotic flagella, although distinctions are sometimes made according to function and/or length. Motile cilia are found on protist ciliates like Paramecium. They are how Paramecium moves around. They are also found on the epithelial cells of many internal organs of metazoans, such as the digestive system and the trachea of the lungs. The outer segment of the rod photoreceptor cell in the human eye is connected to its cell body with a specialized non-motile cilium. The dendritic knob of the olfactory neuron, where the odorant receptors are located, also contains non-motile cilia (about 10 cilia per dendritic knob). Cilia are structurally almost identical with the much larger flagella. So much so that it has been proposed protists bearing either should be unified in the Phylum Undulipodia. Previously, Margulis had proposed that the Ciliates alone should be placed in a Phylum Ciliophora. Admittedly, the Protista is a collection of disparate single-celled forms, but while a more sophisticated taxonomy is in flux (changing), Protista is still a useful term. Cilia and flagella are cell organelles, specialised units which carry out well-defined functions, like mitochondria and plastids. It is fairly certain now that all or most of these organelles have their origin in once-independent prokaryotes (bacteria or archaea), and that the eukaryote cell is a 'community of micro-organisms' working together in 'a marriage of convenience'. ↑ 1.0 1.1 Gardiner, Mary Beth (September 2005). "The importance of being cilia" (PDF). HHMI Bulletin (Howard Hughes Medical Institute) 18 (2). http://www.hhmi.org/bulletin/sept2005/features/cilia.html. Retrieved 2008-07-26. ↑ A Dictionary of Biology , 2004, accessed 2010-04-06. ↑ Haimo LT, Rosenbaum JL (December 1981). "Cilia, flagella, and microtubules". J. Cell Biol. 91 (3 Pt 2): 125s–130s. doi:10.1083/jcb.91.3.125s. PMC 2112827. PMID 6459327. This page was last changed on 12 February 2019, at 16:22.